On February 17, 2011, the whole world observed a magnificent display of the spirit of a nation, the vibrancy of copious cultures, the grace of hospitality and the rigor to vie; the opening ceremony of the 10th ICC Cricket World Cup successfully mesmerised the world with innovative ideas and eye-catching performances. 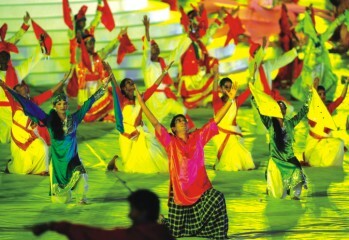 Held in the Bangabandhu National Stadium (BNS), the opening ceremony of the world cup stunned its audience with spectacular array of aerial cricket, remote-controlled LED kites, breath-taking fireworks, the rickshaw-ride entries of the 14 skippers, the “18 till I die” Bryan Adams, and not to mention, the splendid displays by each of the hosting nations. Many were lucky to get the “sonar horin” (extremely hard to get) tickets and many of us had our own adventurous, funny, and occasionally heart-touching stories to catch the glimpses of this gala event. Sharzil, a young spirit, is one of those cricket enthusiasts who failed to get a ticket for the opening ceremony. But that wouldn't shrink his desire to witness the “first time in history” event in Bangladesh. He, disguised as an electrician's “assistant”, was chased by the police, and he sweet-talked a guard of a building near the stadium, to finally watch the glances of the opening ceremony…from a roof top. That was one of the millions of such stories. A few cinema halls arranged the live broadcast of the ceremony so that thousands of people could get a close feeling of the real thing. 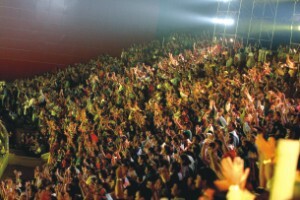 And audiences of those cinemas, like their counterparts in the BNS, waited from the afternoon for the show to start. Students and teachers were glued to the big screens as the pleasantly surprising ceremony took their breaths away. 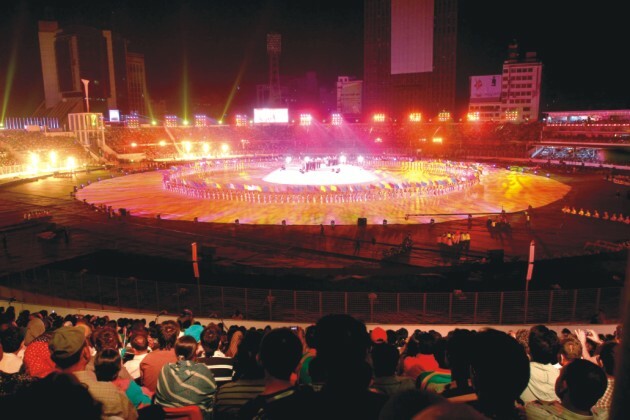 Baffling all the sceptics, with one and a half years' planning and six months' arduous rehearsals, Bangladesh along with the event manager Wizcraft International Entertainment and with the help of athletes and technical experts from China, pulled off an immaculate display of splendour. The multifarious culture of India presented the world with a marvelous nation where people from different culture and ethnicity have come together to form a mighty nation. The blue and white shades of the Sri Lankan performance picturesquely unveiled the history of the pearl of the Indian Ocean. Bangladesh presented itself with the energy of the youth and with the glory of the past generations. Students from different schools in Bangladesh performed on the choreography of the legendary dancers Shamim Ara Nipa and Shibli Mohammad. 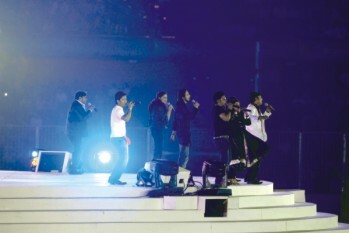 The whole nation hummed and lip-sang with the performances of the popular singers both from the past and the present generations. Bryan Adams moved the flavour from tradition to rock and roll. And the theme song of the ICC World Cup performed by Shankar-Ehsaan-Loy from India wiped the nation with cricket craze once again. The opening ceremony was truly just the opening of the following cricket fiesta. Facebook was flooded with “statuses” stating how proud people are to be Banglad-eshis. “Beautiful Bangladesh” directed by Gazi Shubhro, elicited the patriot in every Bangladeshi. Families were out on pick-up vans and trucks trolling around the newly decorated, dazzling Dhaka City, floating our national flag. After a long time, our nation has directly contributed to an international event. This feeling of involvement and importance has definitely created a hope in the hearts of the 150 million Bangladeshis. After ages, the whole nation seemed to stand together for a cause; the people, forgetting the miseries of their personal lives have been selflessly wishing well for the 15 young cricketers who have taken the gargantuan responsibility to fulfill a nation's dream and expectation. The positive mode that has touched every aspect of the nation is reflected on the reactions of the cricket lovers after Bangladesh lost their first match to India! Even while commenting, people barely said “they”, it was “WE threw a good fight” or “WE will do better”. The World Cup has truly brought the nation together and all the visiting teams will be fighting with the 150 million Bangladeshis in spirit. So, “Maar Ghuriye” Bangladesh! Show'em what we are made of, today and always.